Are you just popping in for WCMD? I’m posting videos every three hours to celebrate “our” holiday…celebrate with me by posting your creation inspired by one of these videos, and tagging me on Instagram, Facebook, or link up your blog in a comment on one of today’s posts – I’ll be sending my halloween cards to participants! 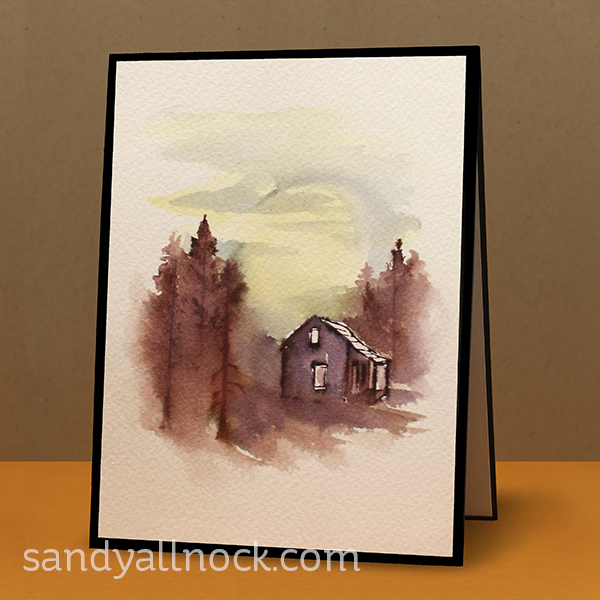 New watercolor stamps from AI – FUN!!!! Oh my. I just get excited when they come out with new ones, because by that time I’ve usually forgotten to get mine out. I have an obscene collection of them, but when I want to play – I have a great selection! LOTS of cabins and houses are in the new release – it’s all listed in the supplies below. I’ll show you four cards in the video, 1 at real time and the rest Speedy Gonzales style.Watch the video below or click HERE to see it in HD on YouTube. These others show some different layouts for houses and trees – and some different ways to do skies for fall. 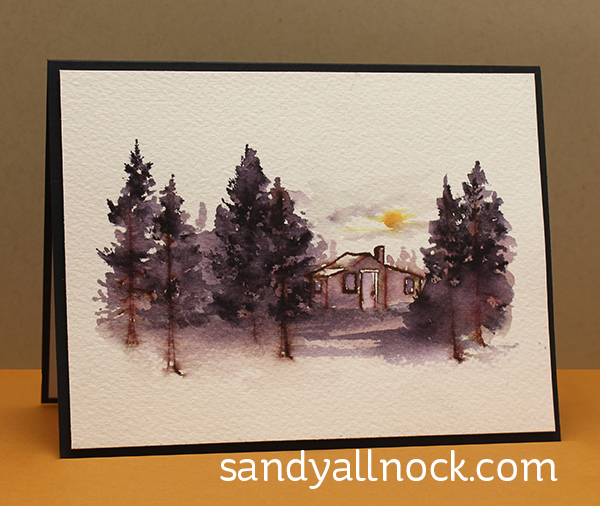 This one is more wintry – truly amazing to use that black marker and end up with purple watercolor, eh? These are so neat and makes me feel like I am there. Sandy, this is an awesome card, love the video and love these stamps. I do have a question about these markers. I have the zig clean colors, a 48 pack, am a bit hesitant with the brush tip, am not overly good with the brush tip. I am wondering if you think for more of my stamping and watercolor look if you think this style marker might help me a bit or would I be disappointed with the look for coloring in my other stamped images? thanks. The tips feel more “normal” if you’re not used to an actual brush, so they may really help. Sandy, Yesterday was a great day of creating good things. I don’t have anyone to craft with but I really enjoyed your series of videos for the day. It made me try new things and adventure out of my norm. So thank you very much for crafting with me on World card making day. It was lot of fun. Diane (Quiltbaglady). I love the way the stamps let you decide by yourself what you going to do with it and you made gorgeous cards with it. You are one of the greatist artists I know when its about sceneries. 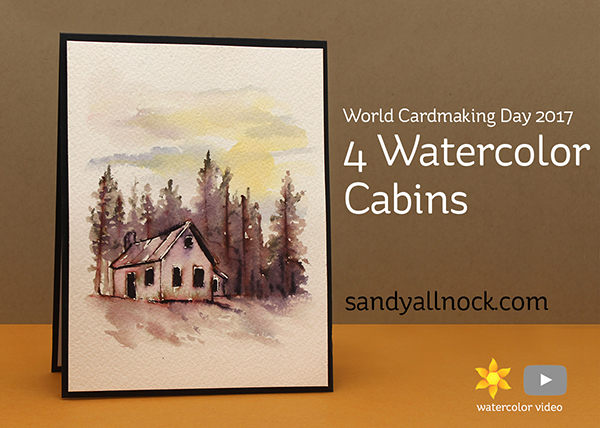 Thank you so much for all your time and effort to enjoy and inspire us on World Card Making Day! This video is a joy to watch! I love these cards created with the AI stamps. The scenes are beautiful. 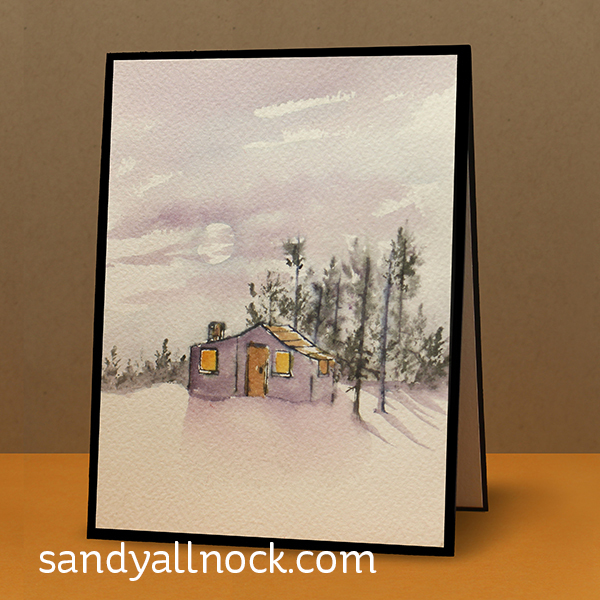 I especially love the wintry card! Great mood created with those colours. Oh my, I love these, Such beautiful water coloring. I must get me at least one of these cabins. Way too cool. P.S. Heartfelt thanks for all of the wonderful videos today, dear Sandy! Love the winter scene the most – due to the unexpected sky color. Great idea to use even darker browns to overpower the already dark brown trunks instead of trying to disguise the area with a lighter color. I always learn while watching and listening. Thanks! This video is my favorite of the day, and it was a difficult choice. I wish I would have had time to participate in your WCMD challenges. I did follow your videos during the day, though. As it turns out, I made 5 cards, but they had a pre-ordained purpose. I just ran out of day (and energy) to work further. Great job on your challenge! Oh Sandy, these are so amazing! The second one (below the video) reminds me a little of our cabin in the woods that over looks a lovely river. This is where I love to be with my colouring and paint supplies. Although I am still only learning to water colour, these are just the types of scenes I would like to practice on. Then someday I could make a collage of the said paintings for on the cabin wall to enjoy! BTW, its Thanksgiving weekend here in Canada and it has been a busy day for me so I am just getting to watch these, albeit from the last one down to the first but I am working on it. LOL TFS! This was a fun, relaxing day – watching you do all the work! Loved every card you made, and will get to work here shortly, myself on some of those watercolor cards- thanks again for all you do! Gosh Sandy, I like them all. You would ask a mother to pick a favorite would you?